For gamers, mouse mats are absolutely indispensable peripherals, especially for FPS and RTS games players. We can’t have good keyboard and headphones, but we can’t have a good game mouse pad. Indeed, a good mouse pad allows players to have a more smooth sense of control in the game, provide precise positioning for the mouse, and enable players to play their best level in games or games. 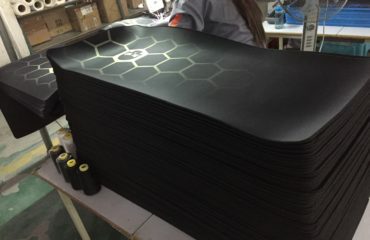 The brand of the game mouse pad are: the mouse pad through the fire line game, the Razer game mouse pad, the Hellfire game mouse pad, the Lei Tuo game mouse pad and so on. What are the regular specifications of the game mouse pad? Such as: 250*300mm, 275*355mm, 300*450mm. The thickness varies from 3mm, 4mm, 5mm, 6mm. Material classification game mouse pad: fine cloth cloth game mouse pad, mouse pad, rubber cloth mouse pad, mouse pad, mouse pad, mouse pad, glass, aluminum foil and so on; but the mouse pad rubber cloth + occupy the market more than 90%, and now the introduction of sewing game mouse pad, mouse pad, wrapping game. When the mouse pad is cleaned, we’d better not use a brush or laziness with the washing machine. Hand wash is the best way, try not to rub and use the twist only gently. The important point is that we cannot get exposure to the sun, which is the biggest harm to the mouse pad. If we don’t use the proper way, the use of mouse pad will not be long. How to wash the mouse pad is actually so simple, it is important to use a good cleaning method. Do not wash like laundry on the right, the main mouse pad material is not the same, to clean the time to pay attention to these.